So how do get to the root of the why? Glenn started with a timeline that many have probably seen before. It included the 2014 Israeli/Hamas conflict, the 2012 Gaza conflict, the Second Intifada (2000), the Fist Intifada, the 1968 Six Day War, and the 1948 Arab-Israeli War. While most timelines documented the Israeli-Palestinian conflict would end there, Glenn took it a step further – all the way to the beginning of World War I. Below is a map of detailing the Allied (orange) and Central (purple) Powers: According to Glenn, this map highlights the “root” of the Middle East tensions we have come to know today, and, for the purposes of this show, Glenn was particularly interested in the Ottoman Empire. Glenn said. “Reestablishing these borderlines, it’s at the center of everything that is happening today.” Neutralizing the power of the Ottoman Empire was at the center of western strategy at this point in time. Great Britain sent an army officer by the name of T.E. 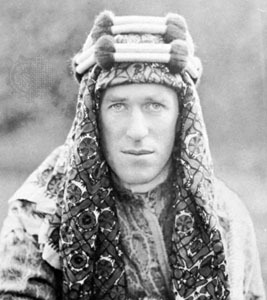 Lawrence to the Middle East to convince Arab leaders to fight against the Ottomans. “He promised them absolutely everything, the moon and the stars and everything underneath,” Glenn explained, “including one key thing: Rule over a new united Arab kingdom of Greater Syria.” Lawrence was successful in recruiting forces, but Britain never intended to honor the promises he made. Instead, Britain was busy negotiating with France about how to divide the region. After all, they needed to ensure no united Arab kingdom ever got in way of their economic and societal goals. “The Middle East was now fractured, which, if you keep it fractured, the British and their allies in the region can control it. They wanted it that way,” Glenn said. “So new lines were drawn, and these new lines never existed before. There were no countries like this before, but they existed under Sykes-Picot.” The Arabs were forced to accept the agreement, and, by 1921, modern problems were starting to manifest themselves. Glenn explained. “It wasn’t about the Jews, and it wasn’t about the Arabs. They were scapegoats.” The Arab leaders new the only way to consolidate power once again was to unite around a common enemy, and that enemy was the Jews. Through the 1920s and 30s, there were a string of violent acts carried out against Jews in the region. It culminated in the 1936 Arab revolt against British peacekeeping troops. The true motive of the Arab world becomes clear once you consider what happened in 1947. With the British mandate in Palestine set to expire, the Palestinians were finally offered exactly what they said they wanted: Their own land. A two state solution was proposed with 56% of the land going to the Jews and 43% to the Arabs. Jerusalem would be international territory. Below is a map of the 1947 UN Partition Plan: The Jews accepted the deal. All the Arabs need to do is sign on the dotted line, and the land will be theirs. But, alas, they refuse. Why? Because peace with Israel means the Jewish scapegoat the Arabs were using to cultivate power suddenly goes away. After highlighting some of the little known details of the 1948 and 1968 wars, in addition to the dark history of Arab on Arab violence, Glenn drew the all-important parallel between this historical analysis and today’s world. Earlier this week, Glenn explained the important distinction between ISIS and ISIL on his radio program. “The Islamic State of Iraq and the Levant, that’s the difference between ISIL and ISIS. The L stands for Levant. It stands for this part all the way down to Egypt,” Glenn said. “They’re doing nothing but remolding the map closer to their heart’s desire and what they were promised 100 years ago. Now is their opportunity to achieve what they’ve always wanted from the very beginning, a return to a unified Arab kingdom—what a surprise, a caliphate, Islamic rule.” Until this region is returned to Arab control, the fighting will not end. There is no easy or obvious solution, but, now more than ever, it is important that Americans and westerners understand the facts so they can understand the end game.